Of course, my first drawing was my own name. I was bored one day and decided to draw a few Hash Names as literal as possible. 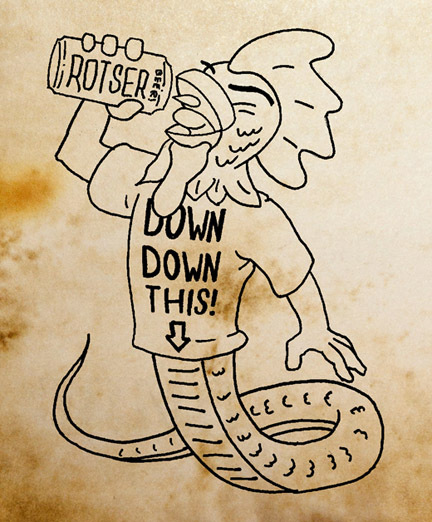 I drew my own name as a half snake/half chicken chugging beer. I drew my friend (Chewbacca Likes My Cocka) as Wookiee approving of a chicken in my hand. This snowballed into every hasher in my kennel wanting a Literal Hash name. Then visitors wanted one of their own. I started a Tumlbr account to share my creation with the world, which got posted to Reddit and everything blew up from there. This started as a fun hobby for my local kennel and now has a worldwide audience, so I thought I should take it to the next level and actually do this for Hashers from other Kennels and set up a way that they can, in return, tip me whatever they feel my efforts are worth. If you recognize the words above but have no idea what they mean, you are probably not a Hasher and this site probably isn't for you. Or, you are a proper Hasher and are shitfaced drunk right now and wondering where your pants are. In case you were wondering, I am Black Snake Chicken Chugger and I hail from the original and only Oklahoma City Wild Wild West Hash House Harriers. Weehee!